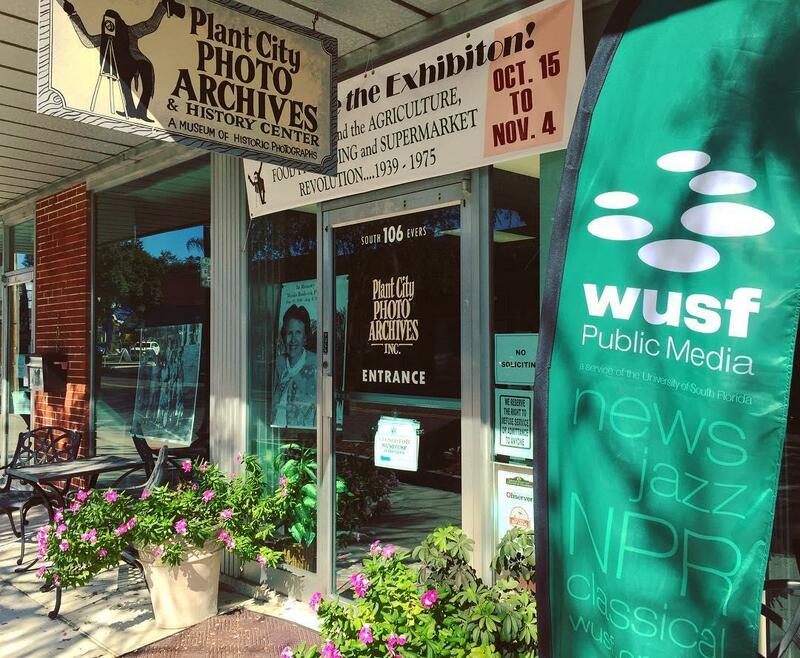 Florida Matters teamed with USF student journalists to tell the stories of Plant City, taping most of the interviews at the Plant City Photo Archives and History Center. Gil Gott, Executive Director of the Plant City Photo Archives and History Center, talks to a USF student journalist outside of the Archives. USF student journalist Becca Demski, left, speaks to Hannah Benton, the 2006 Florida Strawberry Festival Queen. Johnson's Barbecue owner Owen Johnson, left, talks to WUSF's Mark Schreiner and USF student journalist Yara Zayas. The Plant City Photo Archives and History Center is home to move than 120,000 images and other items from Plant City's past. Junior Archivist Jaden Felix is interviewed while USF student journalist Yara Zayas takes his picture. WUSF's Stephanie Colombini, left, and Mark Schreiner conducted the interviews with the students at the Plant City Photo Archives. The first installment featured a diverse group of Plant City residents. They talked about the agricultural landscape, revitalized downtown and African American history of the Hillsborough community. One place we visit this week is the Plant City Photo Archives and History Center, which houses more than 120,000 images and countless other items that capture the town's legacy. 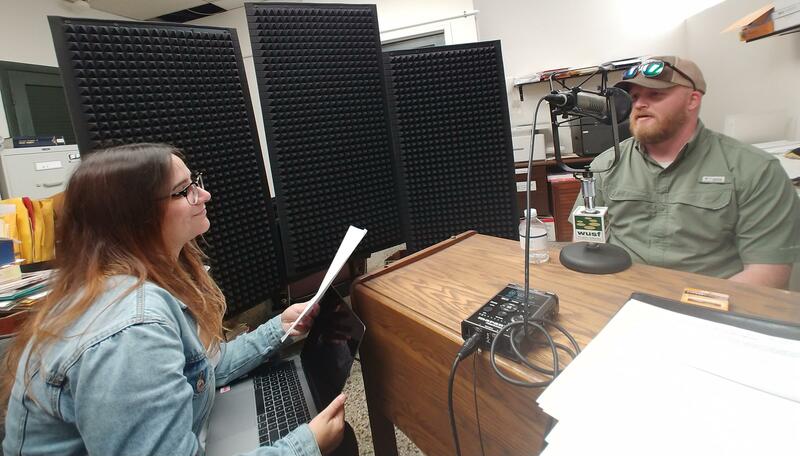 USF student journalist Alexa Ignacio interviewed the archives' founder, Ed Verner. We also spoke to Owen Johnson, the owner of Johnson Barbeque. The restaurant, which is one of three his family owns and operates in Plant City, has fed generations of residents and people who travel from miles around. 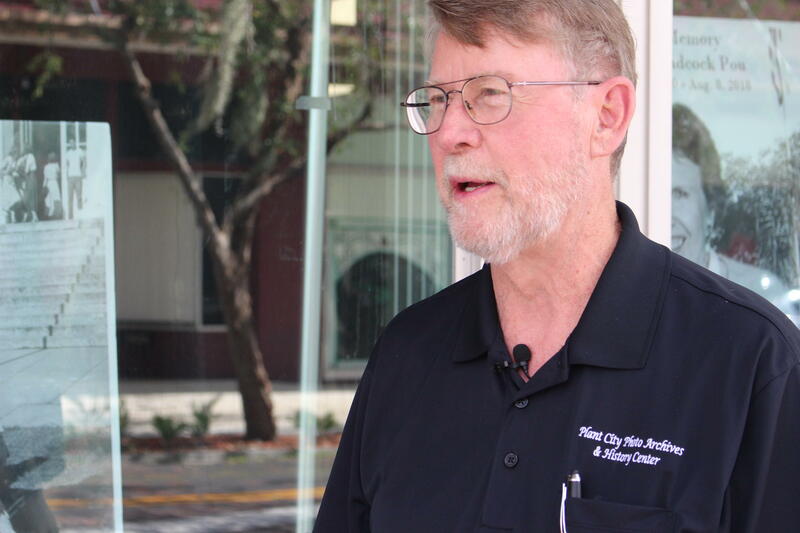 USF student journalist Yara Zayas takes us to the restaurant and captures a bit of the interview with Johnson in this video overview of Plant City and the project (about 2:43 in). We start this week’s stories with the event that Plant City is known for worldwide, the annual Florida Strawberry Festival. Plant City Photo Archive and History Center Executive Director Gil Gott knows as much about the Festival as anyone, having co-written a 2017 book about it called The Florida Strawberry Festival: A Brief History. “The Strawberry Festival is one of the largest and best events in the country and it could not exist at all if it weren't for volunteerism, and people in the city love it,” said Gott. “Most people identify with the Strawberry Festival for numerous reasons: one, it's family-oriented. They don't have any alcohol there. It's also celebrating the fact that the strawberry is one of the biggest industries in this area,” he said. One of Gott’s fondest memories of Plant City came in 1999 when the community decided to build the world’s largest strawberry shortcake. He said the effort drew hundreds of volunteers. Plant City held that record for World's Largest Strawberry Shortcake until 2004, when it was broken in the Philippines. Listen to Gil Gott, Executive Director of the Plant City Photo Archives and History Center, talk about the Florida Strawberry Festival. Gott was interviewed by Mark Schreiner and USF student journalist Aldo Puccini. The Strawberry Festival was started in 1930 by the Plant City Lions Club and has grown a great deal. One staple of the festival throughout its long history has been crowning a Florida Strawberry Festival Queen. Hannah Benton won the pageant in 2006 – but it wasn’t without its challenges. In 2005, Benton was all set to compete. But a week before the pageant, she developed Bell's palsy, which paralyzed the left side of her face all the way down to her collarbone, forcing her to drop out of the competition. But Benton’s father – and the pair’s favorite country band – served as her inspiration to return. At the time though, the musical acts for the 2006 Festival hadn’t been announced yet. That changed in December 2005, when Big and Rich was named as the final headliner. Benton, 30, now owns RAOK (Random Acts of Kindness) Boutique in Plant City. She said her experience as Strawberry Queen helped her gain a lot of confidence. Benton said her time as Queen more than a decade ago gave her mentors and friends she has today – something that seems to still surprise her. And as happy as the experience has made Benton, there may be one person even more excited about it. Listen to Plant City business owner Hannah Benton talk about winning Florida Strawberry Festival Queen in 2006. Benton was interviewed by Mark Schreiner and USF student journalist Becca Demski. Owen Johnson is one of the many vendors serving up food each year at the Strawberry Festival, but that's just a side job for this restaurant owner. Johnson’s family has built a food dynasty in Plant City: his dad, Fred, co-owned the Buddy Freddys restaurant chain with brother, former State Representative and Hillsborough County Supervisor of Elections Buddy Johnson. The pair sold the business in the late 90’s. Fred then opened Fred’s Market in Plant City, and a short time later, Johnson Barbeque, right next door. Now, there are four Fred's locations, and Owen owns the barbeque restaurant. USF student journalist Yara Zayas, left, interviews Owen Johnson, owner of Johnson's Barbeque in Plant City. “We have a lot of customers that we see, if not daily, a couple times a day,” he said. However, he added that more than a few people have come for lunch from out of town at least once a week for years. “It has become a place where you know people go there from the time they're real little and they still see the same people in there working. I mean we've got servers that have been there as long as I've been around – our kitchen manager has been with us 20 years,” said Johnson. And it’s more than a meeting place for the community: political candidates often stop by, as do the musical acts that play at the Strawberry Festival. Listen to Owen Johnson talk about his restaurant Johnson BBQ, which has become a Plant City dining staple. Johnson was interviewed by Mark Schreiner and USF student journalist Yara Zayas. Gil Gott talked about the work the Plant City Photo Archives and History Center is doing to preserve Plant City's history and how kids are getting involved. You can see highlights from that interview here. Listen to Gil Gott, Executive Director of the Plant City Photo Archives and History Center, talk about the museum and how kids are getting involved. When Jayden Felix, 9, isn't collecting Legos or playing with his two pet goats, he's helping keep Plant City history alive as a Junior Archivist, a group Gott started to encourage young people to learn about the past. Junior Archivist Jaden Felix, left, poses with USF student journalist Sam Newlon, WUSF's Stephanie Colombini and USF student journalist Yara Zayas. “A Junior Archivist is basically somebody that’s younger than normal archivists that saves photos for historians to figure out what happened in the past,” said Felix, who added that he’s learned a lot of things about his hometown during his time in the club. “I learned that during World War II, they stopped the Strawberry Festival in case Germany or Japan or other countries attacked the United States,” he said. Learning about the town he was born in makes Felix feel closer to it as well – even with its few shortcomings. “I like how Plant City has sometimes warm and humid weather, which is my favorite condition. The only thing that is missing is the beach, but it’s pretty close,” said Felix. Listen to Jayden Felix talk about his experience as a Jr. Archivist. Felix was interviewed by Stephanie Colombini and USF student journalist Sam Newlon. The Junior Archivist club is a perfect fit for history buff Hannah Rice, 11. Rice lives on what she calls “sort of a ranch” with her family and a menagerie she and her siblings help tend to. “Eight turkeys, two dogs, about eight cows and two pigs,” said Rice. Rice showed one of her family’s pigs at last year’s Strawberry Festival, taking sixth place against teenagers. While her brother picked up first place honors, Rice said she turned the tables on him at the Hillsborough County Fair a few months later. 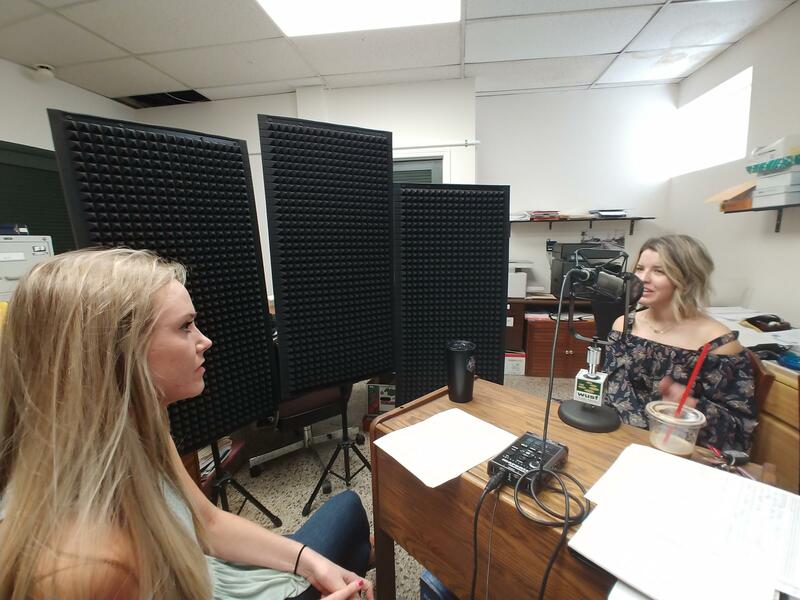 Listen to Hannah Rice talk about the Jr. Archivist Club and share her passion for livestock shows. Rice was interviewed by Stephanie Colombini and USF student journalist Erica Cole. The best way to find out what to do in Plant City is to ask people who have lived there their whole lives - like Tracy and Jay Antle. The two have been married 30 years, having met at Zayre’s Department Store. And they’ve been in Plant City ever since. But they also know a lot has changed – the Zayre’s where they met is long gone, as are a number of other important places in their lives. Jay pointed out that he used to work in one of the three Felton’s grocery stores Plant City used to have – now there’s only one. It’s just part of the changes to their hometown that they’ve had to live with. The Antle’s said that family is what keeps them in Plant City – they have three sons and two grandchildren in town, plus Jay’s parents live there as well. “Plant City is home for us,” added Tracy, before Jay summed up the couple’s feelings. “We go on trips and it's always nice to see the signs saying, ‘Plant City – 20 miles.’ It’s like, ‘Almost home, we’re almost home,’” said Jay. Listen to Tracy and Jay Antle talk about what has changed in Plant City during the many years they've lived there. 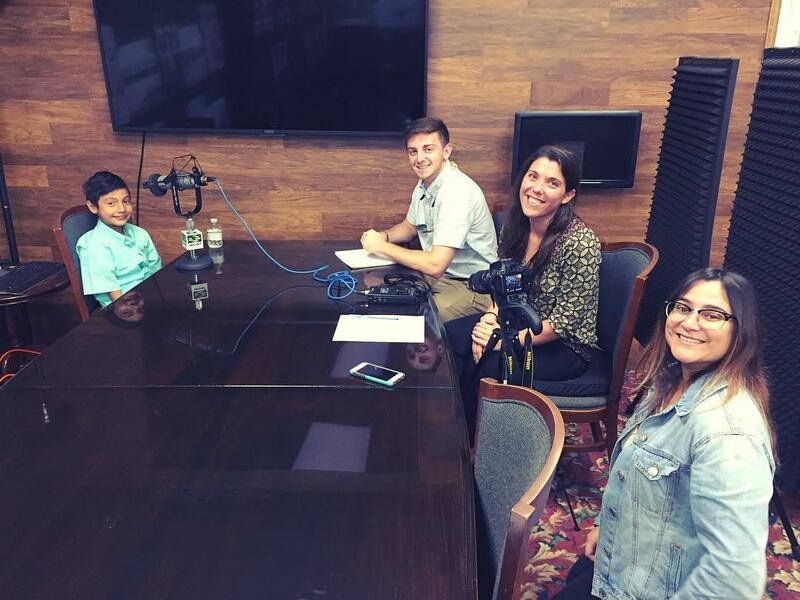 The Antle’s were interviewed by Stephanie Colombini and USF student journalists Chaveli Guzman and Josh Fiallo. This week on Florida Matters we focus on the places and events that make Plant City special, like the Plant City Photo Archives and History Center.